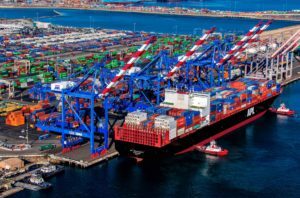 The CMA CGM Group completed the sale of its 90% equity interest in Global Gateway South terminal (GSS) at the port of Los Angeles, United States, informed the company on December 01, 2017. The stake was acquired by the infrastructure investment consortium – EQT Infrastructure III and its partner P5 Infrastructure – for an enterprise value of USD 875 mln. Consequently, CMA CGM received a cash consideration of about USD 820 mln according to the terms of the deal announced last July. CMA CGM will remain a minority shareholder with 10% of the GGS terminal and will continue to be a major user of the facility. The terminal was constructed by APL, when it was part of Singapore’s Neptune Orient Lines (NOL), and acquired by CMA CGM in June 2016 as part of the USD 2.4 bln takeover of NOL. The facility is operating on a long-term concession granted by the port authority of Los Angeles and effective until 2043. GGS is the third largest terminal in the Los Angeles-Long Beach port complex in terms of capacity. In 2017, it is expected to handle over one million containers. EQT Infrastructure earlier informed that together with P5, they have developed a plan to transform GGS from a non-core asset operated as a cost center, into a leading North American terminal in terms of capacity and efficiency. The strategy includes significant capital investments in technology, cranes and other handling equipment. There is also an opportunity for future expansion of yard and berth. The growth of the company will be supported by an industrial Board of Directors with significant ports and container shipping expertise. According to the industry sources, former APL president Kenneth Glenn will be on the GGS Board, while Sean Pierce, former CEO of the Turkish port operator Yilport, and currently head of P5 will act as the terminal’s CEO. The disposal of GGS enables CMA CGM to strengthen its financial structure in line with the strategic plan communicated at the time of NOL’s acquisition, the company stated in its press release. As we wrote earlier, following the NOL deal, the French shipping line announced its plan to sell the NOL terminal assets, that apart from GGS in Los Angeles include facilities at Dutch Harbour in Alaska, at Kobe and Yokohama in Japan, at Kaohsiung in Taiwan, as well as terminals in China (Qingdao), Vietnam (Ho Chi Minh) and Thailand (Laem Chabang).